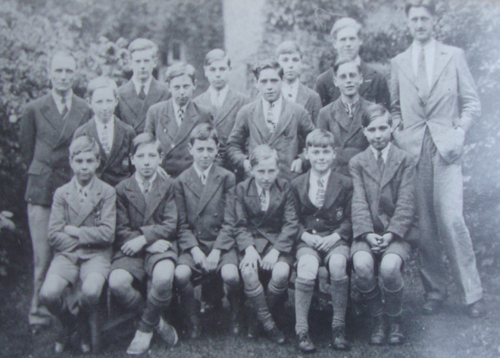 At the turn of the twentieth century it was decided by the Crown that Bushy House was to be offered to the distinguished gentlemen of the Royal Society for the founding of the National Physical Laboratory. Bushy House is typical of this part of the world at the time, an ornate country house or stately villa set in acres of landscaped gardens and it would prove a perfect setting for the finest minds in the land to gather to share ideas and work on world-changing inventions such as the concept and application of packet-switching on electronic networks that is recognized by the Internet Society to have greatly influenced the creation of the Internet. The story of how Newton’s Apple Tree ended up growing in the garden of Bushy House is picked up first by fellow arcadian and frequenter of Chiswick House ‘Voltaire’ who in the year of 1727 first published the account of how Newton developed the law of gravity. Sadly, this iconic little apple tree was blown down in a tempest in the year 1820. Or so the story goes. But the story doesn’t end there. Like a phoenix from the ashes parts of the roots were used to grow new trees from the fallen mother. Many years later Kew Gardens received graftings from this same stock and the director at Kew sent one to the director of NPL, just along the river at Teddington. It was planted in 1953 and continues to bear fruit to this day. What this fascinating story shows is how much shared respect we as a nation have for trees. Should a famous event be linked with one then the specimen instantly takes on a hallowed aura and eternal fame. In the case of Newton’s apple tree it has attained a kind of immortality but was it the tree that transplanted itself to Arcadia to be born again from its roots in Lincolnshire with the assistance of men or the other way round? A further philosophical ponderance is raised. With the original tree still growing in Newton’s garden in Lincolnshire, does that make this famous little tree in Teddington a copy, a clone of the original or is it one and the same tree existing in fractal space it being genetically identical rather than an offspring of the original? In The Analysis of Beauty, William Hogarth placed as the focal-point what he termed ‘the line of beauty’. Otherwise known as a ‘serpentine’. These S-shaped curved lines were said to be agreeable with even the ‘eye of the beholder’ as they naturally stimulated our faculties with ‘activity and liveliness’ especially when compared to straight lines which signified stasis or death. Chiswick contemporary and fellow-arcadian Capability Brown, whose tercentenary is celebrated in 2016, in true Augustan spirit made use of these ‘lines of beauty’ in his world-renown landscapes including serpentine paths, earthworks and lakes. as well as furniture design from the Louis XV period. 25 years prior to publication of Hogarth’s masterpiece on aesthetics and just up the road from Hogarth’s House, fellow arcadian William Kent introduced vitruvian proportions into architecture at Chiswick Park with the aptly named Chiswick House. The golden ratio is about self-similar patterns arranged in such a way so as to provide balance of mass in space. this is what allows trees and flowers to remain upright and not completely compelled by gravity to topple by their own weight and the heavy fruits they bear. It is also what allows a more even distribution of light for leaves of all branches thus balancing overall growth. The golden ratio spirals, the line of beauty is a waveform. The golden ratio self-replicates in its infinite variety, the line of beauty is a singular flow that has a clear beginning and end that shouldn’t be repeated as it should remain unique. The golden ratio is found everywhere in nature and is a thing of outstanding beauty, the line of beauty is also found in nature and is more rare and seems to only be found in the most elegant things such as the curve of a well-formed ladies hips, the arch in a swan’s neck and the bend in a river. The line of beauty appears to be related to graceful movement through space something paintings and photographs can’t do justice to. Perhaps this is what fellow arcadian Lord Byron was alluding to in his poem ‘She walks in beauty’.. In beauty, that of favor, is more than that of color; and that of decent and gracious motion, more than that of favor. That is the best part of beauty, which a picture cannot express; no, nor the first sight of the life. There is no excellent beauty, that hath not some strangeness in the proportion. The reality of the golden ratio and the line of beauty raises important questions on the nature of the universe. 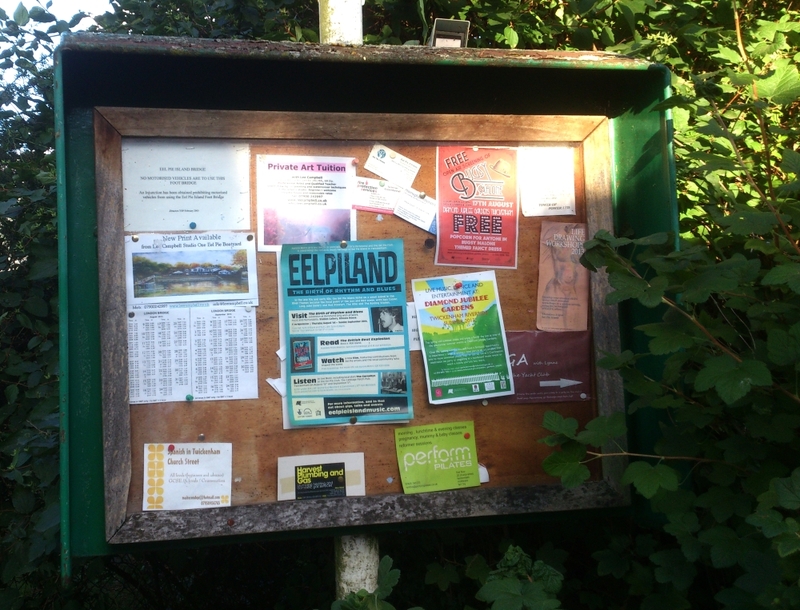 We will be exploring this strange connection in subsequent posts leading up to the release of ‘Arcadia’ (working title) next year – a call to action to revive the arcadian spirit and lifestyle along this stretch of the thames back to its halcyon days. You can follow updates to ‘Arcadia’ on twitter. The Three Pigeons was once a bustling tavern that used to grace the south-west corner of the Brentford Market Place. In its heyday in the 17th and 18th century, when Brentford was a busy market and resort town, it was a coaching inn, which could stable up to one hundred horses. It sadly closed in 1916. There is an etching of The Three Pigeons done in 1848 which gives some idea of the Inn. Fortunately for us, its reputation for entertainment has been captured and preserved in many references to it in literature. I have been uncovering a few, which build a picture of a lively and attractive place and a source of material for writers. But first let me introduce a great Shakespearean actor who was the landlord of The Three Pigeons, John Lowin, and appropriately enough his great role was Falstaff. Of the twenty-five actors who are enumerated in a preliminary page of the great First Folio, as filling in Shakespeare’s lifetime chief roles in his plays, few survived him long. All of them came in personal contact with him; several of them constantly appeared with him on the stage from early days. The two who were longest lived, John Lowin and Joseph Taylor, came at length to bear a great weight of years. They were both Shakespeare’s juniors, Lowin by twelve years, and Taylor by twenty; but both established their reputation before middle age. 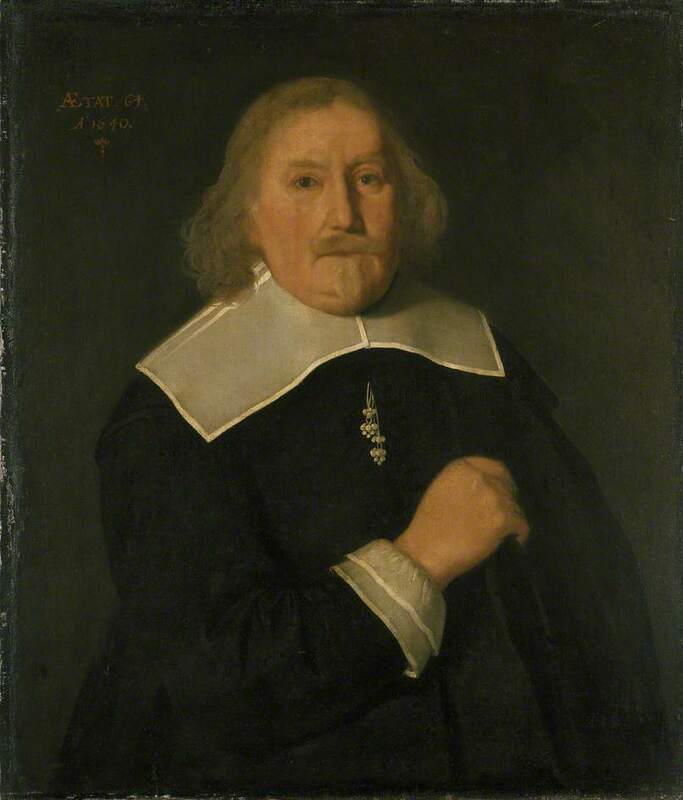 Lowin at twenty-seven took part with Shakespeare in the first representation of Ben Jonson’s “Sejanus” in 1603. He was an early, if not the first, interpreter of the character of Falstaff. Taylor as understudy to the great actor Burbage, a very close ally of Shakespeare, seems to have achieved some success in the part of Hamlet, and to have been applauded in the role of Iago, while the dramatist yet lived. When the dramatist died in 1616, Lowin was forty, and Taylor over thirty. I have not found any evidence for Shakespeare having visited the Three Pigeons, but it would be magical if Shakespeare had thought up the character of the Old Woman of Brentford in The Merry Wives of Windsor, from a visit to the Three Pigeons! 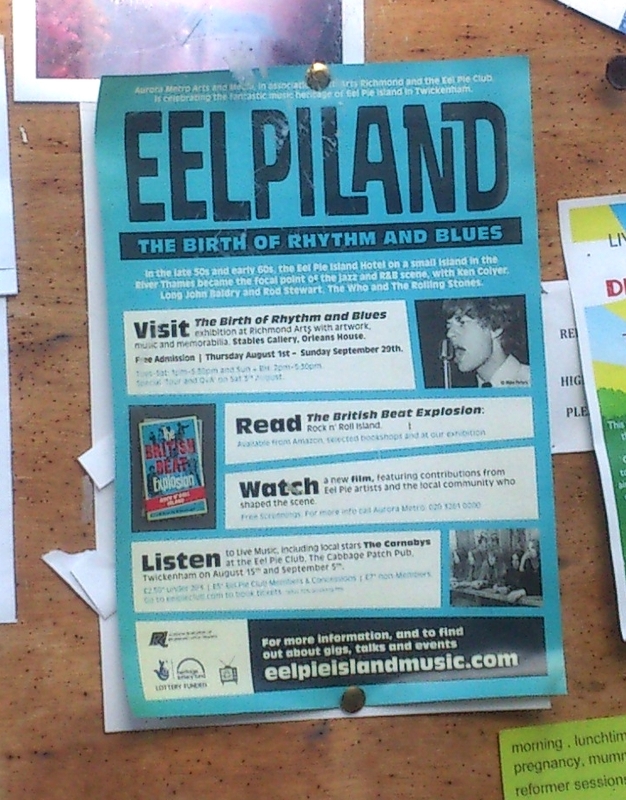 The Eel Pie Hotel has a long pedigree. It was a 19th century tourist attraction and in the 1920s and 30s it hosted ‘tea dances’ on its sprung dance floor. With its louche atmosphere, junk shop owner Arthur Chisnall saw it as an ideal venue for weekly jazz dances featuring George Melly, Ken Colyer and Kenny Ball. Many jazz greats performed here. Eel Pie Hotel succumbed to R&B music very early. Many R&B legends performed here – Cyril Davies’ Rhythm & Blues All Stars, Long John Baldry’s Hoochie Coochie Men (with Rod Stewart), John Mayall’s Bluesbreakers (featuring Eric Clapton), the Downliners Sect, the Tridents (featuring Jeff Beck) and of course The Who and The Rolling Stones – all performed on the Island between 1962 and 1967. 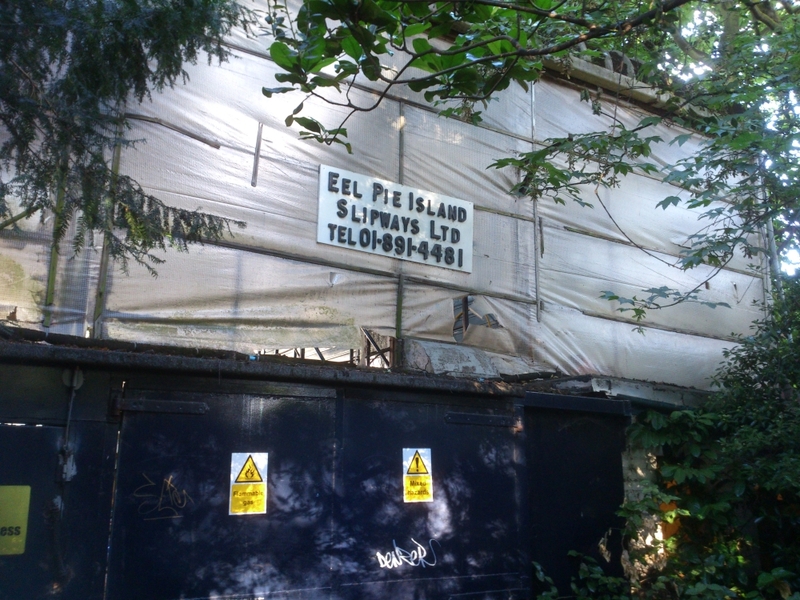 In 1967, Eel Pie Island was forced to close because the owner could not meet the £200,000 worth of repairs which the police had deemed necessary and squatters soon moved in. In 1969, the Club briefly reopened as Colonel Barefoot’s Rock Garden, welcoming progressive bands like Black Sabbath and the Edgar Broughton Band. 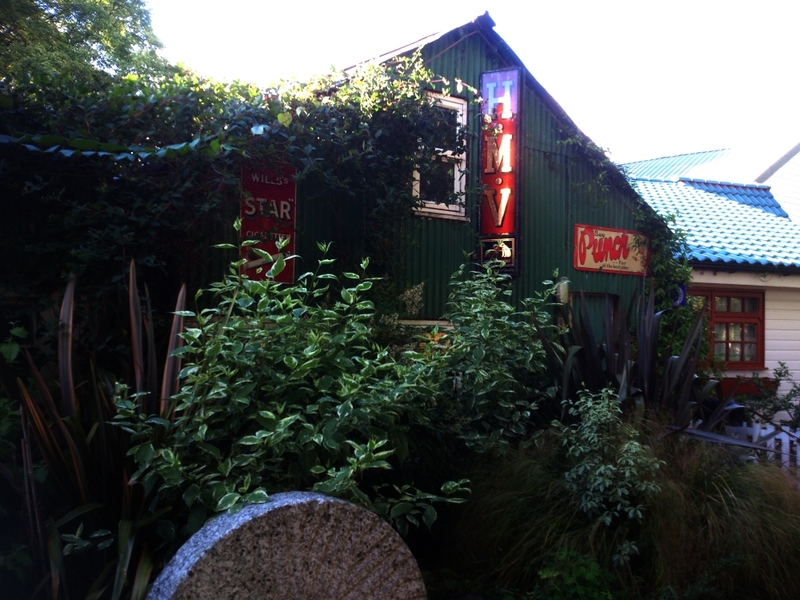 In 1971, after a demolition order, the Eel Pie Island Hotel burnt down ‘in mysterious circumstances’. 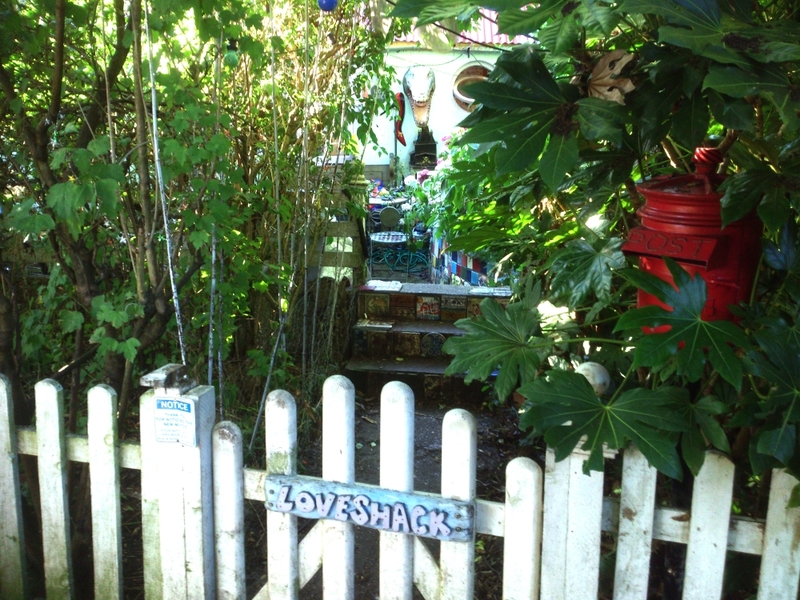 Loveshack: one of many artist studio’s on Eel Pie Island, a hippie commune isolated from the mainland and frozen in time. Standing right beside the A40, a short distance from RAF Northolt, are four conical mounds, the the tallest stands at 26 metres. These are part of Northala Fields, one of London’s newest parks, opened in 2008, and were constructed using waste material from the original Wembley Stadium the new Westfields shopping centre. The mounds shield the rest of the park, created on the former Kensington and Chelsea’s Playing Fields site, which includes a model boating lake, play areas and an amphitheatre, from the noise and pollution of the A40. 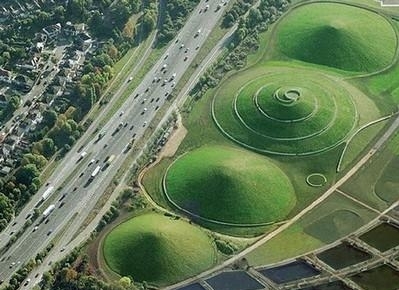 So the mounds served as a landfill as well as sonic shield, but is there a more mystical reason for their creation? Are they homages to the great stone and earthworks of the olden days or simply a direct continuation of them disguised by the seemingly mundane and practical municipal services they happened to offer? 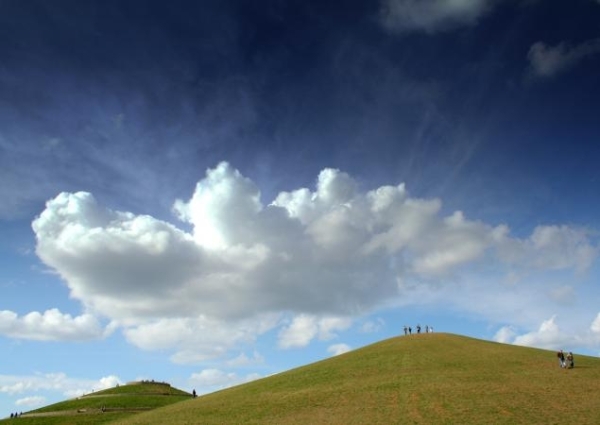 Visitors ascend the largest mound in a spiral motion in an initiation ritual that represents the long up-hill struggle of life and the reward of illumination and the view from above. An interesting aspect about these modern earthworks as well as where they are being located or whether their dimensions follow any kind of sacred geometrical pattern, is that they are digital. They have been designed using CAD. The ancient monuments are analogue designs, as far as we know, created without the assistance of digital computers. This is what give the new earthworks that slightly artificial, slightly too perfect feel to them that you can’t quite put your finger on but you know it when you see it. It’s the same with cars, planes, boats, houses, buildings, music, photography – everything that has been processed digitally during the design phase. 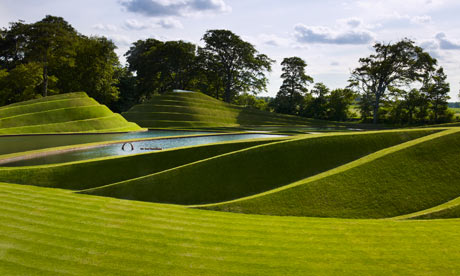 You sense the signature of the algorithms of the software package used to produce the undulating landscape designs. To the modern geographer, the ‘lay of the land’ can be explained purely through geological terms having no mystical significance attached to it. Their bible is the Ordnance Survey with its matter-of-fact cartography of material space and although precise and practical lacks any deeper meaning to the places and the planet it describes. The birth of an island is merely the rising peak of volcanic activity from the depths below that has breached the water-line and not a wondrous act of creation and associated mythology and spirit attached to it. The surface of the earth is just a random sprawl of the aftermath of volcanic activity, tectonic shifts, space debris and earth-quakes. Yet mankind has always placed great importance on the dips and peaks of his surroundings. Mountains are worshipped as gods. Rivers are often-times seen as holy. The river Thames for instance becomes the river Isis as it flows through Oxford. For thousands of years the waters of the river Ganges have been seen as holy. The multi-dimensional time-river the Nile is seen as the ‘tree of life’ providing fertility above and below a vast continent. As the modern world developed, nations placed more importance on artificial demarcation lines and borders based on politics, always marked with straight-lines. The continent of Africa was forensically sliced into rectangular blocks. In the olden days, clans, tribes and peoples were separated by natural demarcations governed by the fracticalities of the flow of rivers, mountain ranges, jungles, deserts and oceans. Villages evolved organically and at their own pace compared to the top-down decisions made by town planning committees such as the Milton Keynes Development Corporation who laid out MK as a grid.